The climate and ecology of land immediately surrounding the Mediterranean Sea is influenced by several factors. Overall, the land has a Mediterranean climate, with mild, rainy winters and hot, dry summers. The climate induces characteristic Mediterranean forests, woodlands, and scrub vegetation. Plant life immediately near the Mediterranean is in the Mediterranean Floristic region, while mountainous areas further from the sea supports the Sub-Mediterranean Floristic province. An important factor in the local climate and ecology of the lands in the Mediterranean basin is the elevation: an increase of elevation by 1,000 metres (3,300 ft) causes the average air temperature to drop by 5 C/ 9 F and decreases the amount of water that can be held by the atmosphere by 30%. This decrease in temperature and increase in rainfall result in altitudinal zonation, where the land can be divided into life zones of similar climate and ecology, depending on elevation. Even within the Mediterranean Basin, differences in aridity alter the life zones as a function of elevation. For example, the wetter Maritime and Dinaric Alps have a North-Mediterranean zonation pattern, while the southern Apennine Mountains and the Spanish Sierra Nevada have a moderate Eu-Mediterranean zonation pattern. Finally, the drier Atlas Mountains of Africa and Taurus Mountains of the Near East have a Xero-Mediterranean pattern. Examples of each of these altitudinal zonation patterns is described below, by examining the climate and ecology of several locations around the Mediterranean Basin. Orjen vegetation profile. 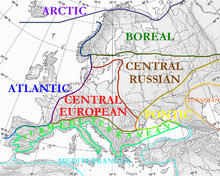 ME: meridional (subtropic belt); NE: nemoral (temperate zone); BO: boreal (taiga zone); AL: alpine (tundra zone). An example of the wetter (or maritime) pattern comes from the Orjen range in the southeastern coastal Dinaric ranges of Montenegro and Bosnia-Herzegovina. Eu-mediterranean (lower subtropical belt, ME=meridional) 0–400 metres (0–1,312 ft), Holm Oak (Quercus ilex), Kermes Oak (Quercus coccifera), Olive tree (Olea europaea). More humid habitats show Bay Laurel (Laurus nobilis) and Oleander (Nerium oleander) formations. Supra-mediterranean (upper subtropical belt) 400–1,100 metres (1,300–3,600 ft), Macedonian Oak (Quercus trojana) and Oriental Hornbeam (Carpinus orientalis); above Turkey Oak (Quercus cerris) and Hungarian Oak or Italian Oak (Quercus frainetto). With more humidity: Forests of Sweet Chestnut (Castanea sativa), Downy Oak or Pubescent Oak (Quercus pubescens) and European Hophornbeam (Ostrya carpinifolia Scop.). Oro-mediterranean (temperate zone, NE= Nemoral) 1,100–1,450 metres (3,610–4,760 ft), Forest of Common Beech (Fagus sylvatica) over calcareous soil. Dinaric calcareous block fir forest; European Silver Fir (Abies alba). Alti-mediterranean (taiga zone, BO= Boreal); 1,450–1,700 metres (4,760–5,580 ft), European Beech (Fagus sylvatica), Bosnian Pine (Pinus heldreichii), Greek Maple (Acer heldreichii) at the Tree line. The less humid regions have Juniper (and for example: Iris orjenii, Viola chelmea) over Sesleria robusta grasses. Cry-omediterranean (tundra zone, AL= Alpine); 1,700–1,900 metres (5,600–6,200 ft), Xerophytes. Trifolium, Narcissus, Gentiana nivalis, Draba hoppeanae, Androsace alpina. Note how the mean temperature near sea level is comparable to the high temperature at Crkvice, 940 meters higher. Thermomediterranean zone (Lowland); under 700 metres (2,300 ft) elevation. Summers are hot here and winters almost nonexistent. This zone is mostly used for agriculture, but studies say Mastic (Pistacia lentiscus), Common Juniper (Juniperus communis), (Aristolochia baetica) and Mediterranean Smilax or Common Smilax (Smilax aspera) would normally grow here. Rosemary (Rosmarinus officinalis), Purret (Ulex parviflorus) and Gum Rockrose (Cistus ladanifer) are present on poor soils or after forest fires. Mesomediterranean zone (Submontane) 700 to 1,300 metres (2,300 to 4,300 ft) elevation. The summers are here still hot but frosts are normal in the winters. In this zone Mastic (Pistacia lentiscus), wild Olive (Olea europaea) and Mediterranean Smilax or Common Smilax (Smilax aspera) grow. Poor sandy soils have few species with the Holm Oak (Quercus ilex), the Common Junipers, (Juniperus communis), Daphne gnidium and Etruscan honeysuckle (Lonicera etrusca). Supramediterranean zone (Mid-Montane) 1,300 to 1,900 metres (4,300 to 6,200 ft) elevation. The summers are here temperate and frosts and snow are frequent in winter. Quercus pyrenaica predominates, Portuguese Oak (Quercus faginea) and maple appear too; these three species make up the forest. More frequent are the Sessile Oaks (Quercus petraea) between 1,300 and 1,750 m. The Sessile Oaks are dominated by the Holm Oaks (Quercus ilex) and, depending on soil and altitude, by bushes as Common Juniper (Juniperus oxycedrus), barberry (Berberis hispanica), (Daphne gnidium), Butcher's broom (Ruscus aculeatus) and Common Hawthorn (Crataegus monogyna) over basic soils. Oromediterranean zone (Subalpine) 1,900 to 2,700 metres (6,200 to 8,900 ft) elevation. In this zone, coniferous plants and sparse Juniperus thurifera appear. The vegetation is composed by trees and bushes (Scots Pine (Pinus sylvestris), Savin Juniper (Juniperus sabina), Juniperus communis subsp. hemisphaerica, Prunus ramburii) and other bushes (Vella spinosa, Erinacea anthyllis, Bupleurum spinosum). On better soils the Common Juniper, Juniperus communis and Cytisus appears, forming communities with Arenaria imbricata, Festuca indigesta. The endemic flora is present too: Genista versicolor, Arenaria pungens, Potentilla nevadensis. Cryo-oromediterranean zone (Alpine); 2,600 to 2,800 metres (8,500 to 9,200 ft) elevation. Ligneous plants can not grow here because of the seasonal dryness typical of the Mediterranean climate and the presence of snow for more than 8 months. The vegetation has similarities to the Arctic tundra, with the Mat-grass (Nardus stricta) as the most common species. Thermomediterranean vegetation belt, 150 metres (490 ft) (south) and 100 metres (330 ft)(north); Pistacia lentiscus shrubs and dense mediterranean coastal scrub (maquis) with Quercus ilex, Phillyrea, Myrtus communis and wild olive (Olea europea var. sylvestris). Mesomediterranean vegetation belt, up to 700 metres (2,300 ft) (northern slopes) and 900 metres (3,000 ft) (southern slopes); Erica arborea, Arbutus unedo and Quercus ilex. Forests include Quercus suber, Pinus pinaster, Quercus pubescens and Castanea sativa too. Supramediterranean vegetation belt, 500–700 metres (1,600–2,300 ft) up to 900–1,000 metres (3,000–3,300 ft) (northern slopes), or 800–1,000 metres (2,600–3,300 ft) to 1,200–1,350 metres (3,940–4,430 ft) (southern slopes); Erica arborea, Quercus ilex, Quercus petraea, Pinus nigra ssp. laricio, Almus cordata, Ilex aquifolium, Taxus baccata and Ostrya carpinifolia. Montane vegetation belt, 900–1,000 metres (3,000–3,300 ft) to 1,600 metres (5,200 ft) (northern slopes) and 1,300 to 1,800 metres (4,300 to 5,900 ft) (southern slopes); forests of Pinus nigra ssp. laricio, Fagus sylvatica and Abies alba. Quercus ilex, Quercus pubescens, Pinus pinaster, Castanea sativa and Erica arborea not present anymore. Cryo-oromediterranean vegetation belt, 1,700–1,800 metres (5,600–5,900 ft) to 2,200 metres (7,200 ft) (only southern slopes); above the upper Tree line (Pinus nigra ssp. laricio goes up to 1,800 metres (5,900 ft)), dwarfed bushes of Genista lobelii var. lobelioides, Astragalus sirinicus ssp. genargenteus, Anthyllis hemanniae, Thymus herbabarona, Berberis aetnensis and Juniperus communis ssp. alpina. Subalpine vegetation belt, 1,400–1,600 metres (4,600–5,200 ft) to 2,100 metres (6,900 ft) (only northern slopes); Alnus viridis ssp. suaveolens, Acer pseudoplatanus, Sorbus aucuparia ssp. praemorsa. Alpine vegetation belt, above 2,100 metres (6,900 ft); sparse vegetation. Indicator plants: Rock Speedwell (Veronica fruticans), Potentilla crassinervia, Armeria pusilla, Cerastium thomasii, Phyteuma serratum, Stachys corsica e Helichrysum frigidum. ^ Lakusic (1975). "Priodni sistem geobiocenoza na planinama Dinaridima". God. Biol. Inst. Univ. Saraj. 28: 175–191. ^ Horvat, Ivo; Glavač, Vjekoslav; Ellenberg, Heinz (1974). Vegetation Südosteuropas. München: Urban & Fischer. ISBN 978-3-437-30168-1. ^ a b Grebenscikov, Oleg S. (1960). "The Vegetation of the Kotor Bay Seabord (Montenegro, Yugoslavia) and some comparative studies with the Caucasian seaboard of the Black Sea". Bjull Mskovsk. Obsc. Isp. Prir., Otd. Biol. Moscow. 65: 99–108. ^ a b c "Dinaric Mountains mixed forest". Terrestrial Ecoregions. World Wildlife Fund. Retrieved 2010-11-09. ^ Cikovac, Pavle (2002). Sociology and ecology of Silver Fir forests on Mt. Orjen. Montenegro: LMU Munich, Department of Geography. ^ Antonic, O.; Lovric, A.Z. (1996). "Numerical Analysis of Vegetation Complexes and Community Diversity of Major Coastal Dinaric Mountains". Journal of Vegetation Science. 7 (1): 73–80. doi:10.2307/3236418. JSTOR 3236418. ^ "Climate of Crkvice (1960-1991)". Hydrometeorologic Institute of Montenegro. Retrieved 2009-03-16. ^ "Iberian conifer forests". Terrestrial Ecoregions. World Wildlife Fund. Retrieved 2010-11-09. ^ Pérez Raya, Francisco; Molero Mesa, Joaquín; Valle Tendero, Francisco (1992). Parque Natural de Sierra Nevada. Paisaje, fauna, flora, itinerarios. Ed. Rueda. Madrid. ISBN 84-7207-067-0. ^ Prieto Fernández, Pablo. Flora de la Tundra de Sierra Nevada. Ed. Universidad de Granada. ISBN 84-600-1810-5. ^ del Castillo, Aurelio; del Castillo, Antonio (2003). Sierra Nevada: Guía de Montaña. Ed. Penibética. ISBN 84-932022-3-1. ^ "Valores Climatológicos Normales. Almeria & Almeria / Aeropuerto". ^ "Datos climátológicos de Sierra Nevada (1975-1989): Phytosociological Research Center". Phytosociological Research Center. Retrieved 2009-03-16. ^ "Corsican montane broadleaf and mixed forests". Terrestrial Ecoregions. World Wildlife Fund. Retrieved 2010-11-09. ^ Mayer, Hannes (1988). Die Wälder Korsikas. Wanderungen durch ein Waldparadies. Stuttgart, New York: Gustav Fischer Verlag. p. 79. ISBN 3-437-30586-7. ^ Reille, M.; Gamisans, J.; de Beaulieu, J.-L.; Andrieu, V. (1997). "The late-glacial at Lac de Creno (Corsica, France): a key site in the western Mediterranean basin". New Phytologist. 135 (3): 547–559. doi:10.1046/j.1469-8137.1997.00683.x. JSTOR 2559059. ^ Reille, M.; Gamisans, J.; Andrieu-Ponel, V.; de Beaulieu, J.-L. (February 1999). "The Holocene at Lac de Creno, Corsica, France: A Key Site for the Whole Island". New Phytologist. 141 (2): 291–307. doi:10.1046/j.1469-8137.1999.00343.x. JSTOR 2588561. ^ Gamisans, J. (1991). La végétation de la Corse. Genève: Conservatoire et Jardin botaniques de la Ville de Genève, Suisse. This page was last edited on 13 December 2017, at 05:05 (UTC).